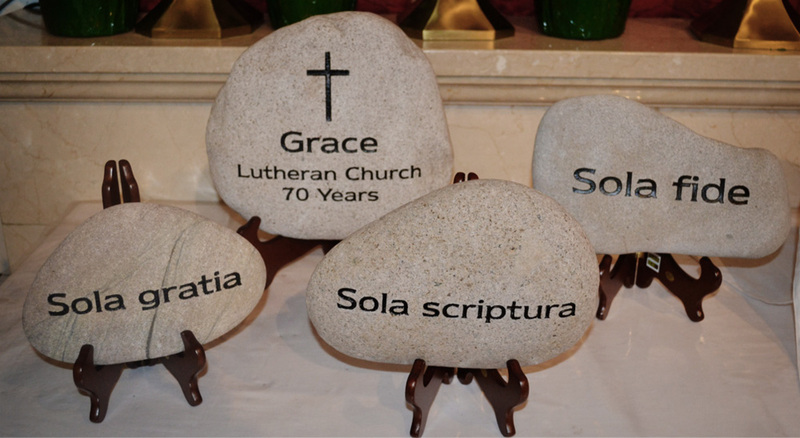 In honor of Grace Lutheran’s 70th Anniversary in 2012, the church dedicated four rocks. The largest centerpiece acknowledges the 70 years of Grace Lutheran. Three additional rocks are inscribed with the Latin phrases: Sola fide (Faith alone), Sola gratia (Grace alone), and Sola scriptura (Scripture alone). At Grace, we care for all of our members who are in need, with prayers, love or help. We celebrate special occasions by helping to set up for weddings, birthdays, retirements, confirmations, and picnics. Our pipe organ is an amalgamation of two instruments. The first was a 4 rank Wicks pipe organ that was acquired and installed in the 1980s. Then, in 2002, we learned of an 11 rank pipe organ that was available. A band of Grace volunteers set out on one of the dirtiest work days ever, which included pulling and stacking every pipe, disconnecting the electronics, and loading it all into a U-Haul for the trip to Broomall. For a combined total of about $10,000 in electrical connections and installation fees, we acquired an organ that, combined with our existing instrument, resulted in a 15 rank pipe organ that more appropriately filled the room of our nave, and would have cost about half a million dollars to purchase new. The electronics of both instruments were well over 50 years old and beginning to deteriorate. In 2011, we replaced the old electric switches in the console with solid state circuit boards, making the instrument more reliable and service free. Now it’s all set for another 70 years of use! Shopping and preparing food to feed the homeless several times each year. We also collect and deliver special articles they need. We support the Life Care Center of Eastern Delaware County, which is a homeless rehabilitation center aiding clients in their search for dignity and independence. With the cooperation of several churches in Delaware County, the clients are fed a hot meal every day of the year. Supporting Thrivent Builds with Habitat for Humanity. Since 2008, we’ve donated more than $2,600 and 300 work hours to reconstruct and build several homes. We’ve become very good at framing, hanging drywall, painting, and basic carpentry as we work alongside the future owners of these homes. Delivering food to the food bank. Collecting monies for Autism research and Alzheimer’s research. Supporting Silver Springs Martin Luther School financially and by collecting and delivering toys at Christmas. Collecting and delivering personal care packages to the women of the Life Care Center of Eastern Delaware County each Valentine’s Day. For more than 20 years, we have held our very successful annual holiday bazaars. Not only do we benefit greatly from the camaraderie within the congregation that we experience in bringing this effort to fruition, but we also realize how much our community looks forward to our homemade soups and baked goods. In recent years, we have added an annual spaghetti dinner. Revenues received from these events go toward our efforts to care for the needy in our community. Grace Lutheran Nursery School was started in the early 1960s when we saw a need for outreach toward the children and their families in our community. We continue to teach and nurture our 2 1/2 to 5 year old children before they enroll in the local kindergarten programs. Learn more about it on the Nursery School page of this website.